It's time for the Dovahkiin to saddle up and crack some skulls! I've never had much use for horses in Skyrim. They get you from point A to point B marginally faster than running, but then you have to find a parking spot, and then you have to remember where you parked after spending 20 minutes running around killing everything within a half-mile radius, and odds are that by the time you get back, the stupid thing's already being eaten by a frost troll anyway. Who needs that kind of aggravation? But soon those equine punching bags will have a little more utility, thanks to the Skyrim 1.6 patch, which fixes a pile of bugs and also adds mounted combat to the game. And unlike a certain other infamous horse upgrade - yes, I'm still tapping that vein - this one will be free. 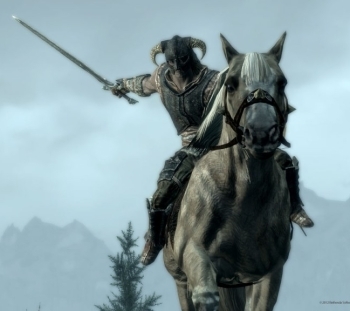 The mounted combat add-on is another product of the Skyrim Game Jam, an internal Bethesda event in which everyone on the development team was given a week to create whatever sort of Skyrim mod their hearts desired. Todd Howard said in February that he wasn't sure how many of those Game Jam creations would actually make it out the door, but the new kill camera and recently-added Kinect support for the Xbox 360 version of the game spring from the same well, so maybe we'll get to see even more in the future. The Skyrim 1.6 update is available now to PC users who opt in to the latest Steam Beta Update, while release information for other platforms will be announced when it's ready. And, since this is actually a patch, plenty of bug fixes and optimizations are included as well, although at this late stage most of them are fairly obscure. The full list of fixes can be found at the Bethesda Blog.